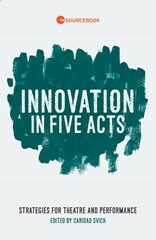 Editor Caridad Svich has gathered forty-one essays from admired theater professionals that comprise a volume of inspiring and innovative techniques for creating theater. Inside are words of wisdom and advice from experienced playwrights, directors, performers, teachers, dramaturgs, artistic directors and founders—each sharing the creative challenges and triumphs of developing original works for today's stages. "In this edited collection, more than forty practitioners and scholars voice their whimsical, fiery, deeply impassioned, political, funny, sometimes elegiac and stinging words prompted by a call to write about "artistic innovation." TCG Sourcebooks is a new series which gathers resources and field conversations generated from current TCG programs. Each volume is published in both paperback and eBook editions and offers varied perspectives by and for theatre practitioners. Other titles in this series include Audience Revolution: Dispatches from the Field, edited by Caridad Svich.